China’s automotive industry has arrived at an inflection point. After a period of breathtaking growth and expansion, the industry is now facing a future of slower growth at a level comparable to China’s GDP growth. In the aftermath of the global financial crisis, China quickly responded by launching the Automotive Industry Stimulus Plan in early 2009. This plan included specific measures designed to spark the growth of consumer demand. Measures including the reduction of sales tax for cars below 1.6L engine displacement, along with subsidies for new minibus or light truck sales for rural residents resulted in a rapid market expansion particularly in China’s lower-tier cities, helping to boost the performance of the manufacturers of these smaller vehicles. While aggressive tax cuts and subsidies sparked demand growth in 2009 (up 46% year-over-year) and 2010 (up 32%), these incentives were eliminated in 2011. As a result the market growth slowed significantly to 2.5% in 2011. Looking ahead, annual car sales are expected to maintain a growth rate comparable to the growth in China’s GDP, approximately 7%, between now and 2020. In December 2011, Beijing government released a new policy on “Beijing Traffic Relief Initiatives” and according to the policy; Beijing will issue only 240,000 new plates in 2011, 88% for individual usage, 10% for corporate usage, 2% for commercial usage. A lottery method is adopted for all plate allocation. Similar policies could also be seen in several other big cities such as Shanghai, Chengdu, and Guangzhou. Other large cities such as Xian and Nanjing are likely to have similar policies in the near future. It can be said that the global automobile industry has been burdened by overcapacity caused by overly ambitious expectations of market growth together with excessive optimism towards new products and technologies. The same can now be said for China, which is now the most hyper-competitive market in the world, with numerous foreign as well as domestic brands competing for the business. In China, the top 20 manufacturers account for over 90% of sales. With over 100 manufacturers in the auto business, many sub-scale companies face severe challenges and will struggle to survive in a market dominated by established companies. Moreover, greater than two-thirds of passenger vehicles sold in China carry a foreign brand, indicating that Chinese domestic brands will struggle to remain economically viable in a market where consumers prefer international brands. Capacity additions that are currently planned will likely exceed the vehicle demand by as much as 35% by 2015. As a result, manufacturers will begin to experience significant margin pressure and will be forced to raise incentives to sell-down their excess inventory. As a result, the competitive dynamics in China may begin to resemble the mature markets, where companies experience large up and down swings in annual profits, severe price-based competition, and high emphasis is placed on operational efficiency to maintain profitability. The pressures resulting from this overcapacity development may be the catalyst for the long-anticipated industry consolidation phase. The existence of many weak sub-scale manufacturers is understood, and the China government had articulated a plan in 2009 to consolidate the industry into 2 distinct “tiers”: the Tier 1 group consisting of companies with an annual capacity of 2 million units that are encouraged to acquire smaller automotive companies throughout China, whereas Tier 2 consists of companies with an annual capacity of 1 million units that are encouraged to drive regional consolidation. However, progress toward implementing this restructuring plan has been slow during a booming growth period where all companies were expanding. As the market slows, it is now time to accelerate industry consolidation. This will not be easy, as many companies will resist a top-down push to restructure. Ultimately, market forces must determine the companies that have earned their right to survive this consolidation phase. With slower growth prospects and a fragmented landscape of manufacturers, we may be tempted to become pessimistic about China’s automotive future. However, we must remember this is still the largest and fastest growing auto market in the world, and companies that adjust their strategies to the new growth pattern will prosper. First, demand will become more “binary” as lower tier cities develop and grow at rates higher than the higher tier cities. There is enormous growth potential in the lower tier cities and provinces in China. While the wave of car buying has swept over China’s tier 1 and 2 cities, over 80% of the population lives in tier 3 and lower cities. Compared to the higher tier cities that are confronted with the problem of market saturation as noted before, the lower tier cities have greater potential for growing demand, and consumption of automobiles in the future. Moreover, this process will be further promoted, as the Chinese government places a focus on boosting the economic development of these regions. Some companies have started to seize the opportunity. For example, GM’s mini-vehicle China JV (SAIC-GM-Wuling) introduced the first own-brand car (Baojun, meaning treasured horse) to target the fast-growing lower tier consumer, aiming to combine world-class quality & low ownership costs. By becoming a pioneer in moving down the to compete in the low end market, GM-SAIC-Wuling aim to capture the shift in the growth pattern toward lower-tier cities and provinces. Second, shifting demographics and consumer preferences can generate profit opportunities. While growth may have slowed in certain segments, there remain tremendous and profitable growth opportunities in smaller emerging growth segments. Companies need to have good strategies to fully cater to an increasingly diverse set of customer needs. For example, compact SUV sales grew at an annualized rate higher than 40% in 2011, and sales of premium cars remain strong resulting from the expansion of China’s upper middle-class population. Third, companies must grow their localized capabilities in the areas that help create competitive advantage. That involves building a deeper understanding what makes their brand competitive in China, and localizing the human resource capacity in areas such as research and development, and network development. In an era where efficiency becomes more critical, it is especially important for companies to fully localize the volume products sold in the China market. For example, Hyundai has achieved nearly 100% local content for Elantra, and likewise Volkswagen has achieved the same for the Lavida. The ability to deliver highly localized cars suitable to the local market needs is a capability that will increasingly depend on localized talent. Finally, growing profits does not simply mean selling more new cars. With the growth of the auto market in recent years, the demand for after-sales service, maintenance, and used car sales is growing as well. In response to the slowdown, manufacturers and dealers must recapture growth by building capability across a variety of after sales services, including establishment of a sub-dealership network and heavier involvement into service delivery and innovation. The China auto market has passed an inflection point, downshifting from double-digit annual growth to a slower and more sustainable pattern in-line with GDP growth. In the future, we can expect to see even more intense competition among the foreign and domestic brand vehicle manufacturers as they attempt to adjust to this new pattern while maintaining profitability. Surviving the inevitable consolidation will require automakers to adjust their strategies to this new growth pattern. Bill Russo, is the President and CEO of Synergistics Limited, and a Senior Advisor with Booz and Company. He lives in Beijing and has more than 25 years of experience in the automotive industry, most recently serving as Vice President of Chrysler's business in North East Asia. The China’s New Energy Vehicle Program is expected to be strategically achieving the better future: global climate change; energy security; urban air quality; and China’s auto industry growth. In 2009, the Chinese government initiated the Ten Cities, Thousand Vehicles Program to stimulate electric vehicle development through large-scale pilots in ten cities, focusing on deployment of electric vehicles for government fleet applications. The Program has since been expanded to 25 cities and includes consumer incentives in five cities. Significant electric vehicle (EV) technology development in China is occurring in industry as well as universities, focusing primarily on batteries and charging technology. The new EV value chain is beginning to develop new businesses and business models to provide the infrastructure, component, vehicle, and related services necessary to enable an EV ecosystem. So far the program has not achieved its initial expectation; the market is still in a vague situation. According to World Bank’s 2011 report, there are several challenges China is facing right now: except introducing the purchase subsidies, the government has to stimulate demand for EV. As private EV cars will be fully involved eventually, integrated battery charging solutions need to be developed. It is emergent to launch a full set of standards include vehicle charging and safety & power grid standards. In the mean time significant efforts underway elsewhere have put many electric vehicles on the road around the world. Based on the huge success of last two annual Green Mobility events, the Green Mobility 2012 aims to discover the challenges and opportunities for the China EV industry and also provide participants with cutting edge insights on relevant technology, economic, societal, trade developments impacting on the industry. Green Mobility 2012 will bring business leaders from the automotive sector from China and Worldwide, along with government officials and senior executives from sectors closely associated with the world industry. (Reuters) - Ford Motor Co (F.N) and its Chinese partner will begin building its first factory on China's coast, where the U.S. automaker can easily access the country's growing number of affluent buyers. The $760 million factory is one of five Ford is building to cement its place in the world's largest auto market. Ford is also building a third assembly plant at its manufacturing hub in the central Chinese city of Chongqing. Building vehicles in Hangzhou - a city of more than 6 million people to the south of Shanghai - draws Ford closer to China's wealthier population along the coast. It also provides Ford with an accessible port so it can export vehicles in the future, although Ford said it is now focused on building cars for the Chinese market. "Hangzhou is really critical because of the market that it serves, and it diversifies our operations," Chief Executive Alan Mulally said after a groundbreaking event in Hangzhou on Wednesday. "The customer base here is fantastic." Since 2006, Ford has poured nearly $5 billion into China with the aim of doubling capacity, employees and dealers by 2015. The plant in Hangzhou will be able to build 250,000 vehicles when it opens in three years. Ford is the latest in a long list of automakers vying to launch or expand top-tier brands in China, where luxury car sales are expected to surpass those in the United States within 8 years. 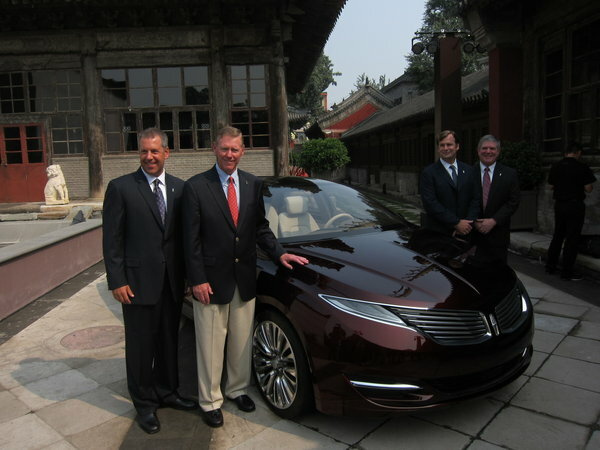 It plans to bring its Lincoln brand to China by 2014. At an event at a converted Buddhist temple in Beijing on Tuesday, Ford executives said Lincoln could win over buyers partly by drawing on its legacy of building iconic cars like the Zephyr and Continental. But they also said China represented a rare chance for Lincoln to reinvent itself and skirt past its stale image, which has hurt sales in the United States. "We have a chance to be different here," Ford's global marketing chief Jim Farley said. 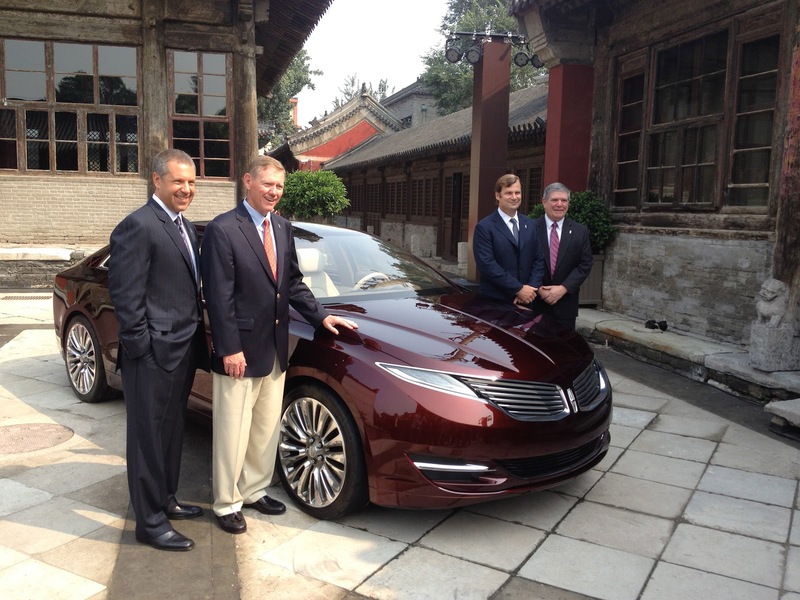 "We see the opportunity in China for the first time to launch Lincoln from scratch. China could teach us things we could incorporate into the experience side in North America." By offering a premium car with Lincoln, Ford could be more attractive to dealers, helping the company gain traction in the Chinese market, Booz & Co consultant Bill Russo said. The U.S. automaker is also launching 15 Ford brand models to China by 2015. One of those will be a low-cost car to appeal to buyers in China's fast-growing cities in the West. That model will rival the Chevrolet Sail, a car developed by General Motors (GM.N) and its Chinese partners that sells for less than $10,000. Earlier this week, Mulally and other top executives marked another groundbreaking of the automaker's third assembly plant in Chongqing, home to Ford's massive manufacturing hub. The complex is close to China's rapidly developing inland cities, where Ford is looking to win buyers with low-cost models. Ford chose to build a factory along China's east coast after deciding to break up its three-way tie-up with Japan's Mazda Motor Corp (7261.T) and China's Changan Automobile Co Ltd.
China approved that restructuring, which carves up the joint venture assets between Mazda and Ford, earlier this week and it is now being reviewed by Chinese regulators. Mazda was not involved in selecting a site for the factory. "This was a Changan Ford decision and a Changan Ford process," Joe Hinrichs, Ford's head of Asian and African operations, told Reuters. BEIJING -- Ford Motor Co. continued its China blitz Tuesday, announcing that it would join the country's increasingly competitive luxury-car segment by introducing Lincoln automobiles to the Chinese market by 2014. The announcement comes a day after Ford broke ground on its sixth factory in China, a $600-million plant in the southwestern city of Chongqing, and revealed that it had won initial regulatory approval to free itself from a local joint venture to manufacture cars with Mazda. The developments allow the Dearborn, Mich., automaker to ramp up its ambitious expansion plans in China in an all-out effort to catch up with its far more popular foreign rivals, Volkswagen and General Motors Co.
"Lincoln is an important part of our plan, and introducing Lincoln in China marks the next step in our expansion in Asia and our commitment to serving customers in the luxury market," said Ford CEO Alan Mulally, who is touring China. Ford is a latecomer to China but has committed about $5 billion since 2006 to build factories, grow its vehicle lineup and expand its dealership network in the world's second-largest economy. 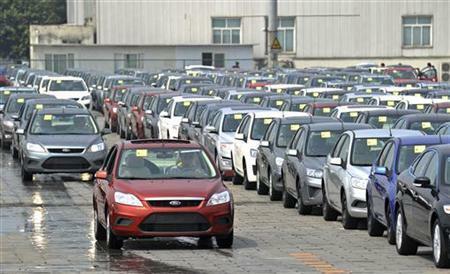 Ford now sells an array of compact vehicles, sedans, SUVs and vans in China. Sales hit just over half a million units last year. Passenger vehicle sales have grown 7% this year, according to LMC Automotive, about 2% below the industry-wide rate of expansion. With the introduction of Lincoln, the company hopes to tap a consumer segment that has been wildly successful for Audi, BMW and Mercedes-Benz. The three German automakers combine for almost 80% of the luxury-car market. Unlike those brands, which manufacture in China, Ford will import the still-to-be-released Lincolns when they're officially launched here in the second half of 2014. A new Lincoln MKZ sedan is to be launched in the U.S. this year, part of a revitalization plan to introduce several new vehicles to the brand's lineup. Ford said it's considering the needs of Chinese consumers in designing the new Lincoln vehicles. The company consulted luxury fashion labels Prada and Burberry because of their experience with China'srich. Spacious rear seats were deemed a must as luxury-car owners in China tend to be chauffeured. The company is also betting Lincoln's nearly 100-year-old history (one that includes many presidential limousines) will resonate in a country that prizes heritage brands. "We have a chance to be different here," said Jim Farley, Ford's head of global marketing, "different from the Germans, the Asian brands, the other American brands, Cadillac. It’s a perfect time for Lincoln to come here because our DNA is different from all the other choices customers have." Ford estimates that luxury-car sales in China will more than double to 2.7 million units by 2020, surpassing the U.S. as the world's top market. As a whole, China posted auto sales of 18.5 million last year, compared with 12.8 million in the U.S. The strength of Chinese luxury auto sales today belies an industry-wide slowdown triggered by over-capacity, China's weakening economic growth and stricter car-ownership restrictions in some of the country's most congested cities, such as Beijing. "The issue of over-capacity has really not affected the high end of the pyramid," said Bill Russo, president of the Synergistics auto consultancy in Beijing and Chrysler's former chief in China. Still, Russo warned that Lincoln would have to find a way to stand out and justify its potentially hefty price tag with engineering performance and interior features. "The degree of difficulty will be high," Russo said. "You have a very established set of competitors in a market with Chinese consumers who already equate luxury with a certain portfolio. Getting them to recognize Lincoln is going to be the main challenge." Michael Dunne, the Indonesia-based head of auto consulting firm Dunne & Co., said Lincoln may benefit from being a new market entrant, especially at a time when Chinese car buyers may be looking for their second set of wheels. "The Chinese like differentiation, something fresh and new," Dunne said. "Land Rover has done well in the SUV segment by essentially just being different. Mainly it's image. Someone might say, 'You have an Audi? Half my friends already have an Audi. I have a Lincoln now.'" 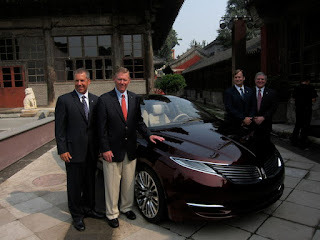 Ford Motor Co. (F), lagging behind General Motors Co. (GM) and Volkswagen AG (VOW) in China, will add the Lincoln luxury brand to its lineup of vehicles in the country as part of the company’s biggest expansion push in half a century. The luxury vehicles will be available in China in the second half of 2014, the Dearborn, Michigan-based carmaker said in a statement today. The company will begin recruiting dealers for the marque in the fourth quarter of this year. Ford follows GM in stepping up efforts to compete in China’s luxury-vehicle market, a segment that researcher IHS Automotive forecasts will more than double and surpass the U.S. by the end of the decade. Volkswagen’s Audi, Bayerische Motoren Werke AG, and Daimler AG (DAI)’s Mercedes-Benz currently dominate, accounting for more than three-quarters of high-end cars sold in the country. Ford is counting on China to help revive growth of its premium nameplate, which has seen deliveries tumble more than 60 percent since their peak two decades ago. Ford, which in 1922 bought the brand named after former U.S. president Abraham Lincoln, plans to unleash seven new Lincoln models -- including the glass-roofed MKZ sedan -- by 2015 as it seeks to attract younger, wealthier customers. Ford is introducing more models and building five factories in China, including a $760 million assembly plant in Hangzhou and a $600 million facility in Chongqing, to double its annual production capacity in the country to 1.2 million passenger vehicles. The expansion will help Ford increase global sales to about 8 million vehicles by mid-decade, up about 50 percent from 2010, according to the company. The automaker has reason to expand. Ford only accounts for 2.4 percent of the country’s light-vehicle market, versus VW’s 19 percent and GM’s 10 percent, according to data from industry researcher LMC Automotive. Ford’s share of the more lucrative luxury segment is practically non-existent. That’s because Audi, BMW, and Mercedes-Benz dominate by accounting for 76 percent of the Chinese luxury market, according to data from research firm LMC Automotive. The German automakers have succeeded partly because they tailored their cars to Chinese consumer preferences, selling long wheelbase versions of traditional sedans to cater to the need for more legroom in the backseat. GM, the biggest U.S. carmaker, is seeking to loosen their grip by renewing a push for its Cadillac vehicles in China. GM said in April it plans to bring in more Cadillac products, increase local production and sales outlets in China to boost sales five-fold and match U.S. deliveries by 2020. At Ford, Mulally is seeking to revitalize the aging Lincoln, which counts 65-year-olds as its average buyers. The brand’s 85,643 vehicles sold in the U.S. last year was a 63 percent slide from its peak in 1990. Ford’s expansion in China will help the company more than double its market share in the country to 6 percent in the next five years and generate income to $1 billion by 2016 from about $137 million in 2011, according to estimates at CLSA Asia- Pacific Markets. Ford’s Lincoln announcement comes a day after it said the National Development and Reform Commission approved Ford’s application to have a separate venture with Changan Automobile Co. instead of the current three-way ownership with Mazda, paving the way for the company to increase control of its China expansion and product rollouts. Ford Motor Co. (F) said it received approval from China’s top economic planner to split its venture in China with Mazda Motor Corp. (7261), paving the way for the U.S. automaker to increase control of its expansion in the country. The National Development and Reform Commission approved an application for Ford to have a separate venture with Changan Automobile Co. instead of the current three-way ownership structure with Mazda, Ford Chief Executive Officer Alan Mulally told reporters in Chongqing, China today. The plan still needs to be approved by two ministries, Ford said in a statement. The separation would restore Ford’s ability to have an equal say as its Chinese partner for the first time since 2006, when the U.S. company transferred a 15 percent stake to then- affiliate Mazda. The Dearborn, Michigan-based automaker has sought to break up the China venture after selling down its stake in Mazda in 2008 to raise cash. Increasing its stake in the China venture to 50 percent would allow Ford to book more revenue from car sales and parts, according to Bill Russo, a Beijing-based senior adviser at Booz & Co.
Mulally was in Chongqing to attend the groundbreaking ceremony for Ford’s third passenger-vehicle assembly plant in the city, which would add annual capacity of 250,000 vehicles a year when completed. The reorganization is still subject to approval from the Ministry of Commerce, State Administration of Industry and Commerce and the Ministry of Industry and Information Technology, according to Ford. Ford this year has disclosed moves to add production output in China, including plans to build a $760 million assembly plant in Hangzhou. The company today signed a letter of intent to expand research and development in the country. Ford Motor Co., a latecomer to China's booming auto industry, is counting on businessmen like Feng Shouming to help the company catch up to more established rivals General Motors Co. and Volkswagen AG. Later this month Mr. Feng will open his seventh Ford dealership in Wuhan, a city of 10 million people in China's interior, a vast region that still offers great potential for smaller players like Ford. Much of the wealth that China's rapid industrialization has created is located along the country's eastern coast, and car buying has skyrocketed around prosperous cities like Shanghai and Hangzhou. But now the Chinese government, in an effort called "go West," is employing economic policies designed to push investment toward the center and west of the country, and bring more prosperity to regions still dominated by farming culture. Ford is betting that push will continue the boom in car buying in places like Wuhan, even as growth in auto sales moderate along the coast. "The automobile industry here is very young and although it is the biggest in the world, it's only been a thriving industry for a decade," said David Schoch, chief executive officer of Ford China. While not giving up on wealthier coastal provinces, Ford is concentrating its efforts on the dozens of cities in central China with populations of 500,000 to five million people, Mr. Schoch said. "We see a tremendous growth opportunity in the middle and the west." To make the strategy work, however, Ford needs people like Mr. Feng who are willing to team up with a company that isn't yet up to full strength in China. In an interview, Mr. Feng said business has been tough, in part because Ford only offers six models in China—the Focus compact and two other small cars; a sport-utility vehicle and a small wagon; and the Mondeo sedan. In Wuhan, Ford faces a strong local state-owned competitor, Dongfeng Motor Corp., which has a full line of cars, vans and SUVs through partnerships with Nissan MotorCo., Honda Motor Co. and Peugeot SA. "We just need to hang in there," Mr. Feng said by telephone. "We have every faith and hope in the next few years." The good news is that Ford is adding a seventh model, the Kuga compact SUV, later this year. On Monday, Ford Chief Executive Alan Mulally will visit a Ford plant under construction in Chonqqing, which is located more than 1,000 miles west of Shanghai and is the manufacturing hub of Ford's China operations. The factory will be Ford's third in China, part of a $5 billion investment plan it kicked off in 2006. The company is also building an engine plant and a transmission plant at the Chonqqing site. When those three plants—plus a fourth being built in Hangzhou in the country's east—are operating, Ford will be able to build 1.2 million vehicles in China, which would equate to about 15% of the auto maker's projected global production in 2015. Because of the heavy investments, Ford's China operations are losing money. Mr. Schoch said results will improve in the second half of 2012 as Kuga goes on sale. Mr. Schoch added that he thinks Ford is "well positioned" in the hinterlands of central China. Yet Ford isn't alone in pursuing growth in these regions. Other auto makers are also putting more focus on China's central and western provinces, too, especially now that some major coastal cities have become so overrun with cars and trucks that they are limiting registrations of new ones, said Bill Russo, an auto consultant in Beijing. "It is only natural that the auto makers are starting to look at how to capture this coming growth. It's not just Ford," Mr. Russo said. China has already surpassed the U.S. as the world's largest auto market. 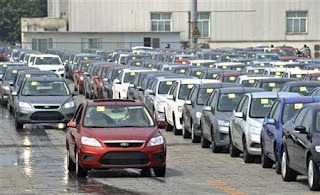 Ford expects China's overall auto sales to increase from 18.5 million new cars this year to around 30 million by 2020. There are about 85 vehicles per 1,000 people in China. The U.S. has about 800 vehicles per 1,000 people. Last year Ford grabbed about a 2% share of the Chinese market, compared with 7.2% for GM brands and 12.9% for Volkswagen. Toyota Motor Corp., Hyundai Motor Co. and Chinese companies such as Geely Automobile Holdings Ltd. are all ahead of Ford, too, according to LMC Automotive. —Yoli Zhang in Beijing contributed to this article.